The Global Warming Policy Foundation (GWPF) is delighted to announce that our book Population Bombed! by Canadian authors Pierre Desrochers and Joanna Szurmak has been shortlisted for the prestigious Donner Book Prize. For those who would like an overview of the case made by the authors, below are some excerpts from their articles and interviews at the time of the book launching. Control the Population, Control the Climate? Not. A recent book explains what’s mistaken about climate alarmists/activists thinking human numbers must be reduced in order to save the planet from us (H/T Master Resource). The Title is Population Bombed! by Pierre Desrochers and Joanna Szurmak who provide an introduction to their assessment in an article at Financial Post For 200 years pessimists have predicted we’d ruin the planet. They’re still wrong. Excerpts in italics with my bolds. Population-growth catastrophism has been around for centuries. In the English-speaking world it is generally associated with economist Thomas Robert Malthus’ 1798 edition of his Essay on the Problem of Population and U.S. biologist Paul Ehrlich’s 1968 bestseller The Population Bomb. Ehrlich and his co-author and wife Anne predicted imminent environmental collapse followed by mass starvation. What they didn’t see coming was that, to the contrary, hundreds of millions of people would soon be lifted out of grinding poverty while parts of the planet became greener and cleaner in the process. In our new book Population Bombed! Exploding the Link between Overpopulation and Climate Change we mark the 50th anniversary of the Ehrlichs’ book by explaining that their predictions bombed because their basic assumptions are flawed. First, the Ehrlichs assume that human numbers cannot exceed the limits set by a finite system. Bacteria in a test tube of food are used to model such a system: Since the levels of food and waste limit bacterial growth, human population growth, by analogy, ultimately cannot exceed the carrying capacity of test tube Earth. Second, they assume that wealth and development unavoidably come with larger environmental damage. This assumption is still at the core of pessimistic frameworks, which maintain that physical resource throughputs, not outcomes, matter. So, countries such as Haiti where deforestation and wildlife extermination are rampant are inherently more “sustainable” than richer and cleaner countries like Sweden and Switzerland. Third, Ehrlich does not acknowledge that, unique among this planet’s species, modern humans: transmit information and knowledge between individuals and through time; innovate by combining existing things in new ways; become efficient through specialization; and engage in long-distance trade, thus achieving, to a degree, a decoupling from local limits called the “release from proximity.” And the more brains there are, the more solutions. This is why, over time, people in market economies produce more things while using fewer resources per unit of output. Corn growers now produce five or six times more output on the same plot of land as a century ago while using less fertilizer and pesticide than a few decades ago. Fourth, the Ehrlichs and other pessimists also fail to understand the uniquely beneficial roles played by prices, profits, and losses in the spontaneous and systematic generation of more sustainable — or less problematic — outcomes. When the supply of key resources fails to meet actual demand, their prices increase. This encourages people to use such resources more efficiently, look for more of them, and develop substitutes. Meanwhile, far from rewarding pollution of the environment, the profit motive encourages people to create useful by-products out of waste (our modern synthetic world is largely made out of former petroleum-refining waste products). True, in some cases dealing with pollution came at a cost — building sewage-treatment plants, for example — but these are the types of solutions only a developed society can afford. Fifth, pessimists are also oblivious to the benefits of unlocking wealth from underground materials such as coal, petroleum, natural gas and mineral resources. Using these spares vast quantities of land. It should go without saying that even a small population will have a much greater impact on its environment if it must rely on agriculture for food, energy and fibres, raise animals for food and locomotion, and harvest wild animals for everything from meat to whale oil. By replacing resources previously extracted from the biosphere with resources extracted from below the ground, people have reduced their overall environmental impact while increasing their standard of living. Why is it then that after two centuries of evidence to the contrary, the pessimistic narrative still dominates academic and popular debates? Why are so many authors and academics still focusing on the Malthusian collapse scenario — now bound to come from carbon dioxide emissions and the teeming populations that produce them? Far from being the catastrophe that Thanos, the Ehrlichs and other pessimists would have us believe, population growth and carbon fuel-based development in the context of human creativity and free enterprise are the best means to lift people out of poverty, to build resilience against any climate damage that increased anthropogenic greenhouse gas emissions might have, and to make possible a sustained reduction of humanity’s impact on the biosphere. 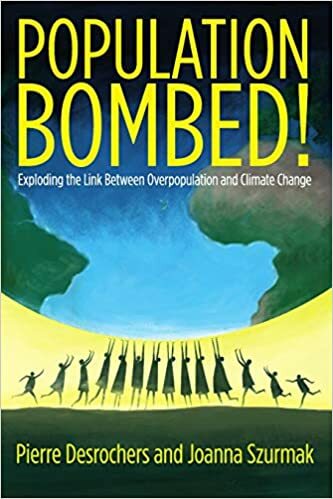 Pierre Desrochers, a geography professor at the University of Toronto Mississauga, and Joanna Szurmak, a doctoral candidate at York University, are the authors of Population Bombed! Exploding the Link Between Overpopulation and Climate Change. The book was launched at an event on Oct. 15th in Toronto. More at their website: Population Bombed! What we need in order to fight environmental degradation is to make sure that people in less advanced parts of the world can also be the beneficiaries of these processes. There is no doubt in my mind that these beneficial substitutions will happen more quickly the cheaper carbon fuels are. Of course, the argument is even more powerful when you think of the social consequences of less affordable energy. Now, as with everything else, bad political institutions in some parts of the world will result in greater pollution as more carbon fuels are burned. The solution, however, is not to ban or tax everything from coal to plastic bags, but rather to improve standards of living and public governance. In my opinion, our guiding principle as far as carbon fuels are concerned should be the creation of lesser problems than those that existed before.